My teenage self would have certainly thought breakouts and acne would be a thing of the past at this stage in my life, however my skin is just SO susceptible to hormonal breakouts. When I can feel a deep breakout forming it is a tell-tale sign that my period will arrive within a few days. At this stage in my life, I’ve kind of figured out a routine to catch and treat them early. However, most of the products that treat acne contain ingredients, such as benzoyl peroxide and salicylic acid that are not safe during pregnancy. 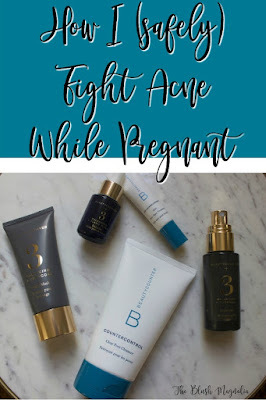 When I think about that gorgeous “pregnancy glow” I certainly don’t think of hormonal acne. But in reality, it has been a struggle for me in both of my pregnancies. When I was pregnant with Madeline, I used this bundle by Belli, a brand of skincare specifically formulated to be safe for pregnant women. The spot treatment uses sulfur instead of salicylic acid or benzoyl peroxide. 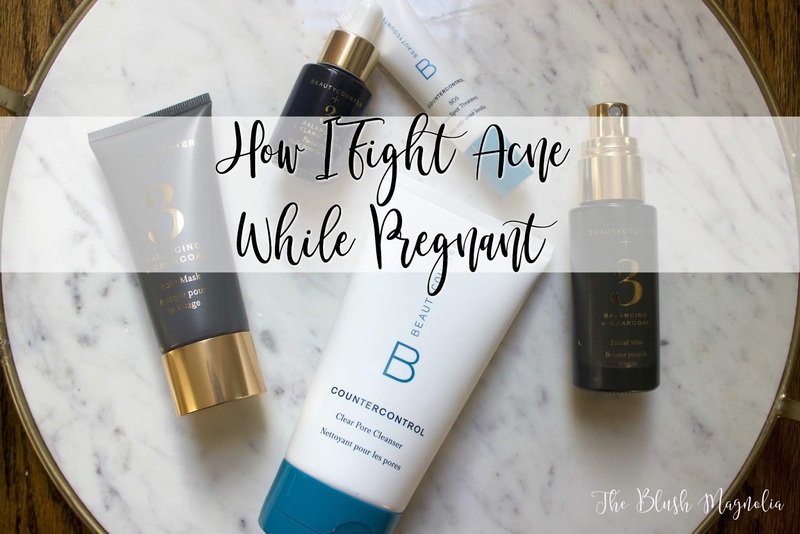 While it really did help with acne, I feel like it didn’t really make my skin feel great overall and I just wasn’t very comfortable with my skin in my first pregnancy. This time around, I’ve switched up my routine a lot. Know better, do better is one of my mottos in terms of all things wellness-related. This time I know a lot more about both skin care (and how to get the results I want) and safe, clean ingredients. I use this charcoal bar to wash my face. Charcoal helps draw impurities out of the pores. At first it seemed kind of weird to me to wash my face with a bar but I had heard such good things about this bar (it is one of our best sellers) that I had to give it a try. I follow that up with the gentle nourishing cleaner with my Clarisonic. If I feel like my face might flare up, I will swap the nourishing cleanser out for this exfoliating and oil fighting one for a few days and it is what I plan to use leading up to that time of the month once I’m not pregnant any more and that joy returns. This cleanser was just released this summer and it is both gentle and deeply exfoliating, making it perfect for fighting blemishes before they hit the surface. I also wash my Clarisonic every day with this gentle, safe Castile soap to keep it free of bacteria that might clog pores. This is the same soap I use to wash my makeup brushes and I consider that be a key factor in prevention of breakouts, too. In the morning, I follow washing my face up with this moisturizer but at night I apply face oil after I wash. 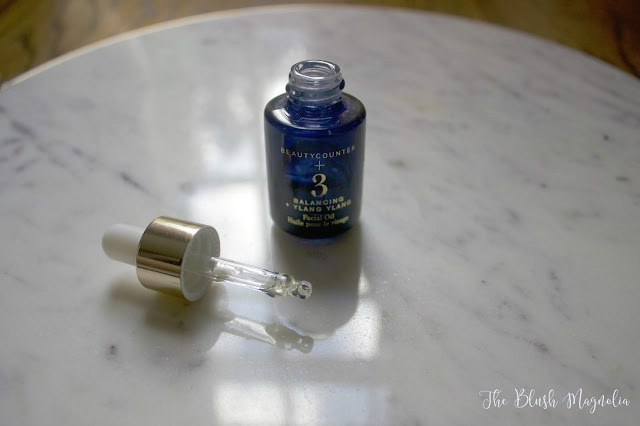 I use the brightening one all over (it smells so good and was an Allure Best of Beauty winner), our plumping oil on my “elevens” and forehead/eye areas that are susceptible to wrinkles, and then our balancing oil on areas of my face that are prone to breaking out. For me, this is my chin and around my mouth. That oil is kind of a magic potion for helping keep my skin balanced and breakouts at bay. Once all that goodness has had a chance to soak in, I follow it up with my night and eye creams. I also think a good exfoliating routine helps keep my pores unclogged. An esthetician once told me that if you are in your twenties you should exfoliate twice a week and once you hit thirty, three times a week. I am thirty so for me, I exfoliate every 2-3 days and I alternate every other time between two exfoliators. I use this gentle exfoliating cream and this scrub containing strawberry seeds. Both contain only clean ingredients and are safe for use during pregnancy (and any time) and keep your skin free of dry skin build up that might clog pores or make your skin look dull. Finally, I swear by masking at least once a week. 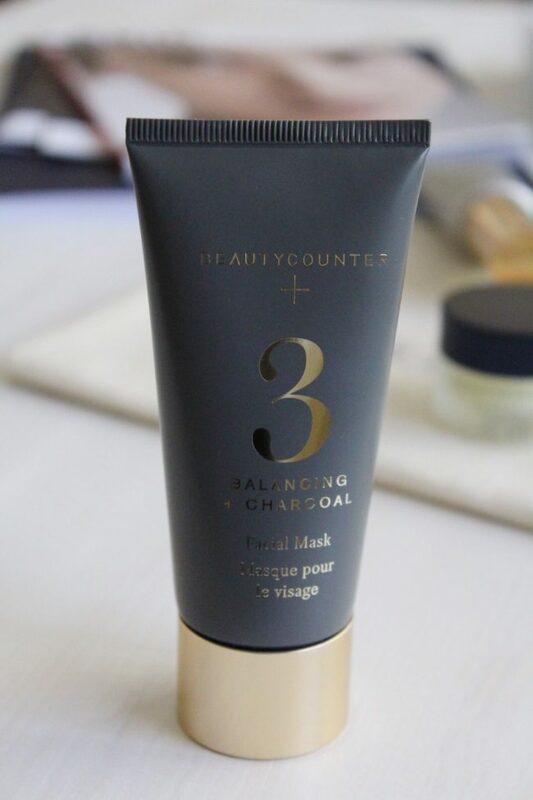 I love this charcoal mask, especially for my nose, around my mouth, and chin - the areas that are prone to breaking out. You can feel it tightening your pores and pulling out any toxins or environmental debris that might be clogging them while you wear it. I like to put it on while I paint my nails or soak in a lavender bath. I did order the Belli spot treatment at the very beginning of my pregnancy for breakouts that are just determined to show up but I am very pleased that I’ve been able to nip most of them in the bud this time around using safe products and my tube is still almost completely full. 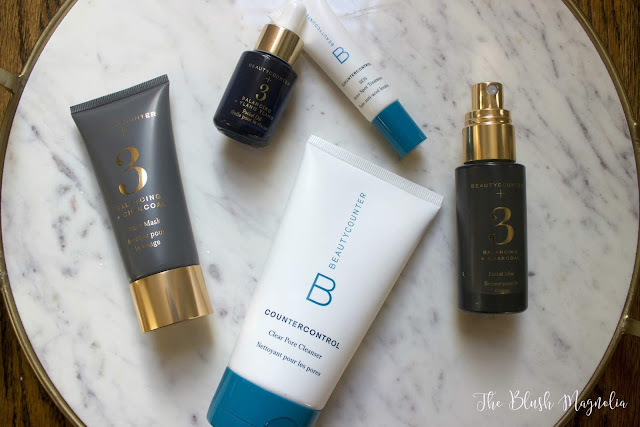 Beautycounter just released a spot treatment (and whole acne system actually) that contains salicylic acid from wintergreen, which is considered safe for pregnancy and while nursing so I of course picked it up right away and am excited to add it to my arsenal of safe products for the next stubborn breakout. Overall, my skin has been SO much better overall and just feels more “balanced” since starting using Beautycounter about a year and a half ago. I don’t really have dry patches or oily zones anymore and I think that using clean products without harmful chemicals has really lowered the occurrence of acne on my skin - but it definitely helps to have an toolbox of safe, effective products for the hormonal breakouts because those hormones aren’t going away any time soon! Those of you who are mamas (or mamas to be) - what are your favorite beauty tips for feeling beautiful while pregnant? Pregnancy hormones are SO REAL. These are great tips for any pregnant or postpartum woman! 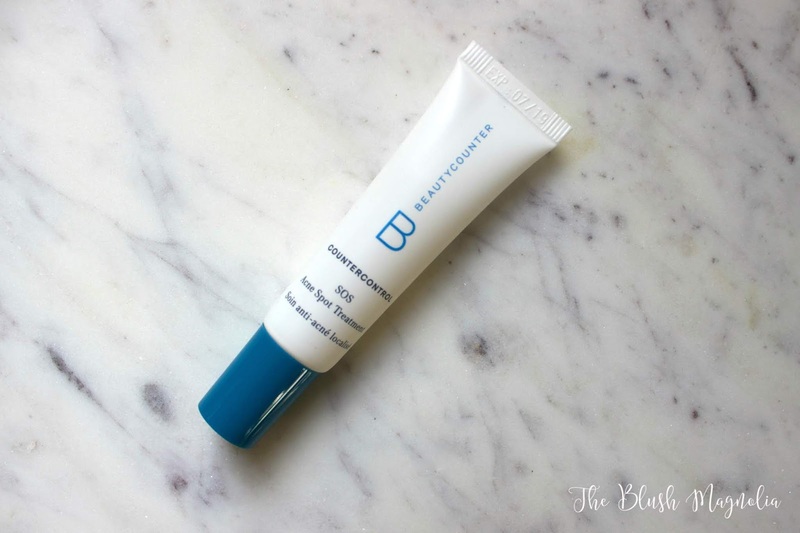 Thanks for sharing -- I've been thinking about trying Beauty Counter for a while now. You know I love all BC products and so excited for the new acne line. Pregnancy acne is a real thing.. not fun at all!